“Bread of Heaven” is a song from Wales. The lyric is by a great 18th century Welsh writer named William Williams, also known as Williams Pantycelyn (there being so many “Williamses” in Wales that it is necessary to give them nicknames in order to be sure that everyone receives the appropriate royalties). 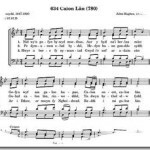 The song became what it is today, however, sometime around 1904/05, when the English version of the lyric was wedded to a recently-composed melody by yet another great Welshman named John Hughes; i.e. 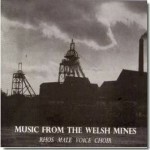 the tune titled “Cwm Rhondda,” after the Welsh valley of the same name. This was during what is known as a Great Awakening or religious revival in Wales, and one that spread (not unlike the tune) to many other quarters. It’s funny: I was talking about this song a few days ago to a few friends, merely sharing my enthusiasm for something I’d only really discovered relatively recently, and I turned on the CD player and played for them the version that I’m embedding at the bottom of this post; then, this morning, it turned out to be the closing hymn sung at my church here in New York City. This caught me quite by surprise, and made me chuckle, and also made me think that I must be supposed to write something about it today. I had planned to write something about it anyway, but at some undetermined later juncture. Well, why put off till tomorrow, etc.? Why, indeed. The thing is, I have very little to say about it. If ever there was a song that spoke for itself, it is this one. But there are details, and context—those things that can sharpen the appreciation for even a song that stands so squarely and strongly on its own. The marriage of William Pantycelyn’s words and John Hughes’ music was apparently one made in heaven as after its emergence around 1905 the song became very quickly and deeply beloved of the Welsh. It has ultimately come to be known as the unofficial national anthem of Wales, and can be heard sung ceremonially at important sporting events (i.e. rugby matches). 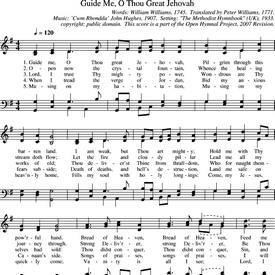 It is a hymn which derives its imagery and narrative directly from the story of the Israelites, led from slavery in Egypt and guided to the Promised Land, as in the Bible from Exodus through Joshua. Key touchstones from that story are invoked to convey the prayer of just one poor sinner, wishing for God’s guidance, trusting in His grace, and offering humble praise. Through the gift of YouTube, one can find an almost-incalculable number of renditions of this song, with its various titles, in various guises. You want it at a rugby match, complete with Tom Jones and beer-sodden fans? You got it. You want it from a chapel in Wales? You got it. You want it at the wedding of William and Kate? You got it. You want a radically different version at an African-American church in the U.S.A., led by Pastor Calvin Johnson, with nary a Welshman in sight? Here it is. How about a Welsh Male Voice Choir from Dublin, Ireland—singing in Boston, Massachusetts? It’s yours. In the language of the great Navajo people: click this link. Cherokee: no problem. Famous soprano Charlotte Church singing the song in Jerusalem: right here. This is scratching the surface of what’s available. It connects with people. People everywhere. One may wonder what this tells us about the song, or one may wonder what it tells us about humanity, and our position vis-à-viz eternity, the divine, and, well, stuff like that. Entirely the listener’s choice. I will embed just two versions here, by the power vested in me. One is as solid and laudable a “conventional” rendition as one could wish for, provided by the glorious Froncysyllte Male Voice Choir. What touches this listener most deeply, however, is in the end an antidote to all of the grand renditions, as genuinely grand as they are. 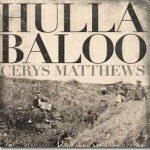 It is an unaffected performance, by a musician named Cerys Matthews, from her rather incandescent album of Welsh standards, titled Tir. (Highly recommended.) Among the things about it that I love is that it reminds the listener that this is the prayer in the end of just one poor pilgrim, albeit joined on a journey with so many others. No need to “update” the lyric; she sings it as it was, and it is as immediate and contemporary as ever.